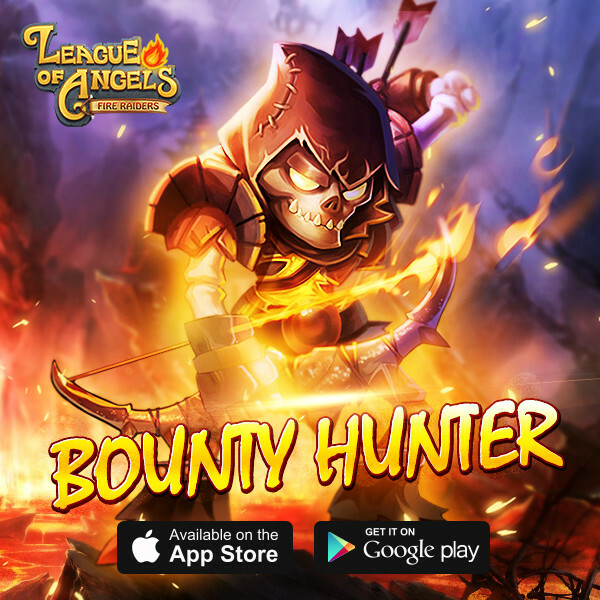 This week\'s theme is Bounty Hunter. Chasing evil is a heroic deed. Winning a bounty at the same time? Even better! But who is the hunter and who is being hunted? We never know the truth until the end. Pick one or several heroes/angels from our game and tell us a story. 1) Post a reply with the story under the topic of this week. 2) Include your IGN & Server. 100 diamonds, 10 Hero chests (1 stars) for all valid story tellers. 1000 diamonds, 15 Hero chests (3 stars) for 10 of them according to the story quality. Spam/illegal Content it will lead to EVENT DISQUALIFICATION. We reserve the right to final interpretation of this event & rewards. It was night, no sound could be heard. Astral Hunter lie in ambush, waiting for his prey: Grimbow. Grimbow had been causing mischief in the past, and when he tried to assasinate the princess, he was put into prison. But since he escaped, the valiant Astral Hunter took it upon himself to bring Grimbow down, so the people could feel a bit safer again. There he was, in the night, the moon shining on his bones. Grimbow was sneaking around the palace, trying to get in. Astral Hunter noticed him before he could sneak past the guards, and shot one of his shining arrows. Astral Hunter knew rimbow could feel no pain, so he shot 6 arrows at once, skillfully placing them between his ribs, into the wall. It was not much of a fight really, Grimbow was stuck and could not move again. Astral Hunter sneaked up on Grimbow and put his boney hands into handcuffs, ready to lead him away. Thanks, was all Astral Hutner could say, feeling a bit ashamed that he had to be saved by a woman. The orange vestige of day transitions into lavender twilight. The shadows will soon devour this place. Sound of bushes are heard from a distance and Berserker Claw leaps into the scene from within the forest. He continues to run, passing countless trees in an attempt to escape this labyrinth. You can run, but you can\'t hide. The armored werewolf pauses to look around as he tries to locate where the voices are coming from. You can not escape your inevitable fate. Using his beast instincts, Berserker Claw senses the location of the voices and flings his huge axe in a boomerang motion. The tree before him is struck by his powerful axe throw and falls onto the ground. The twilight sky now becomes the black night. An arrow comes spiraling from the shadows with pinpoint precision and impales the wolf\'s exposed neck. The great beast has fallen. The mysterious, shadowy figure approaches his downed prey to retreive his arrow. Face covered by the darkness; all you could see were those subtle blue markings around his body and those intimidating yellow eyes. The bounty hunter makes a living pursuing criminals for the price on their heads. ;Sometimes, the bounty hunter captures criminals and brings them back to face trial. But not with Demon Hunter, there is only one word for her targets, Dead. She kills every single targets she hunts. There\'s no place for evil in the world is what she said on every last dying breath of her preys. Now the only thing left she wants is to annihilate the most evilish soul on earth, the Demon Lord, and bring back the peace of realms. IGN: weiweiServer: Bluewitch s11Bounty Hunters are well-equipped and relentless trackers, utilizing a wide array of weaponry from blasters to missiles to flamethrowers. At the base of the Bleeding Hills stretches a thousand-league wood—a place called The Hoven, where black pools gather the tarry blood of the uplands, and the king-mage sits in benevolent rule. Once a sworn protector of the Hoven lands, Grimbow earned a reputation for his skill with a bow. In the three-hundredth year of the king-mage, a demon rose from the sixth hell to lay claim to the forest. In response, the king-mage decreed an unbreakable spell: to any who slew the demon would be granted Life Without End. Unaware of the spell, Grimbow waded into battle, defending his lands against the demon’s fiery onslaught. Grimbow drove the demon back to the gates of sixth-hell itself, where on that fiery threshold the two locked in a mortal conflict. Grievously wounded, the demon let out a blast of hellfire as Grimbow loosed his final arrow. The arrow struck the demon true as hellfire poured out across the land, lighting the black pools and burning Grimbow alive at the instant of the demon’s death. Thus, the mage’s spell took effect at the very moment of the archer’s conflagration, preserving him in this unholy state, leaving him a being of bones and rage, caught in the very act of dying, carrying hell’s breath with him on his journey into eternity. 2019-4-22 02:46 GMT+8 , Processed in 0.075101 second(s), 52 queries .